A new year at Enterprise DNA is ringing in a few changes to set us up for the future. The main change (or slight adjustment you could say) that I want to announce here is to the name of the main training offering from Enterprise DNA. I’ve decided to re-name the ‘Definitive Guide to Power BI bundle’ to an Enterprise DNA Membership. One thing before you read on, if you have already purchased the Definitive Guide to Power BI bundle, you now have an Enterprise DNA Membership, there is nothing else you need to purchase. All these updates and additions are all included. Well, there are a few reasons that I will go into in a bit more detail below. When I began developing on-demand courses for Power BI at the beginning of 2017 I knew I wanted to develop something extremely comprehensive. 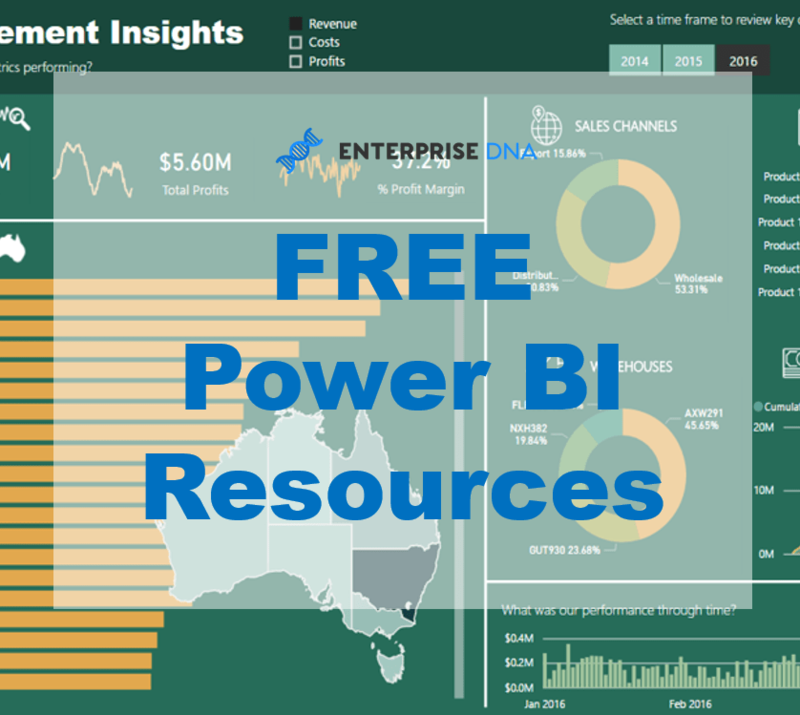 Something that not only taught users how to use the technical aspects of Power BI but how to actually practically implement Power BI across a range of analytical scenarios. At the time there wasn’t really anything else out there (and really still isn’t in my view) that captured all the various different parts of Power BI that I wanted to cover in-depth and then offer this as an all in one encompassing package. So, as I set out and created what I wanted to achieve with the training courses & resources, things grew substantially and Enterprise DNA Online evolved dramatically. Not only that but as Enterprise DNA TV (YouTube channel) took off, along with the live training workshops and learning summits I put on, the resources section has also expanded significantly too. With all the content and materials made available at Enterprise DNA Online, the ‘Definitive Guide to Power BI bundle’ was an appropriate label as the ‘all access pass’ if you like. 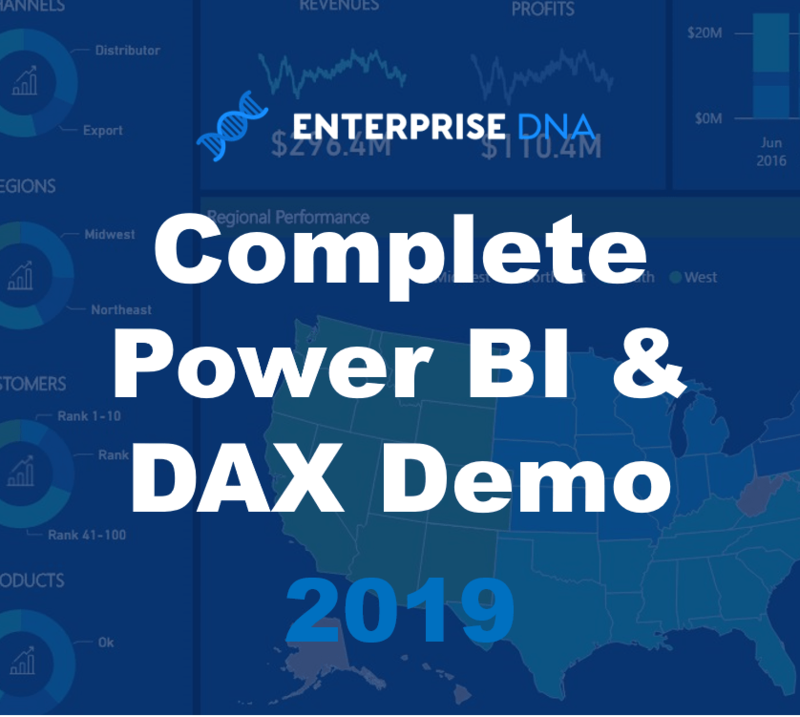 But….with this growth in Power BI users now connected in some way with Enterprise DNA a few things combined have occurred that have got me thinking how I can provide even more support and training to those who are willing to invest in the main paid offering through Enterprise DNA. One thing that has really become unsustainable is the amount of requests for assistance I get through a number of different channels. I have just not been able to answer these and offer this type of support in the past. As you can imagine, offering support takes a lot of time and resource and this is something I have a very limited amount of. Though after a lot of considered thought around Enterprise DNA’s renewed mission, now decided to offer this. I believe there is now a great opportunity to offer questions & answer support to the Power BI community, especially those who decide to upgrade to an Enterprise DNA Membership. For this I have created a dedicated website called the Enterprise DNA Support Forum. This forum is open to all Power BI users as read-only, but if you actually need specific support then you will need to become a paid member. So you will need to already have or will need to purchase an Enterprise DNA Membership. This is not all though as I’ve also thought long and hard about how I can effectively teach Power BI users, not only the technical aspects of development work but how to go far deeper into the analytical thinking and thought process of effective implementation. This will also be the on-going training offering I provide for Enterprise DNA Members. I’m going to do this via some invitation only events where I’m going to teach users via the ‘Scenario Method’ I’ve been developing (more to come on this shortly). Also (there’s more), I plan to introduce a certification for all those who choose to access the on-demand training at Enterprise DNA Online (which you can do via a membership). There is still some planning to complete here but I will be looking to have this implemented by the end of the first quarter of 2018. With these exciting new developments, I believe the ‘Definitive Guide to Power BI bundle’ isn’t an appropriate name anymore for this overall offering, it’s so much more now as I hope you can see. That’s why it is now branded as an Enterprise DNA Membership. 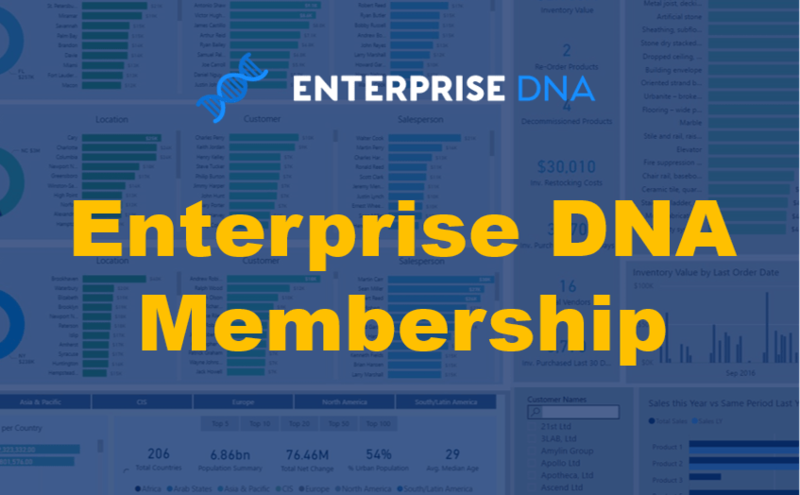 To obtain an Enterprise DNA Membership it’s only one purchase that is required. With that, you will get lifetime access to the membership and offerings around training and support. On top of the new branding, I feel this is now a high quality (the best out there) grouping of courses, resources, support & training for any individual or organisation looking to really develop their Power BI capabilities. My mission through Enterprise DNA has renewed somewhat to not only developing high-quality Power BI users but also empowering the most valuable analytical thinkers who use Power BI as their analytical tool of choice. I think this combined offering is going to achieve this for all those who are looking to form a deeper connection with Enterprise DNA and who decide a membership is right for them. Hopefully this lays things out for everyone, certainly if you have a question let me know if the comments below. 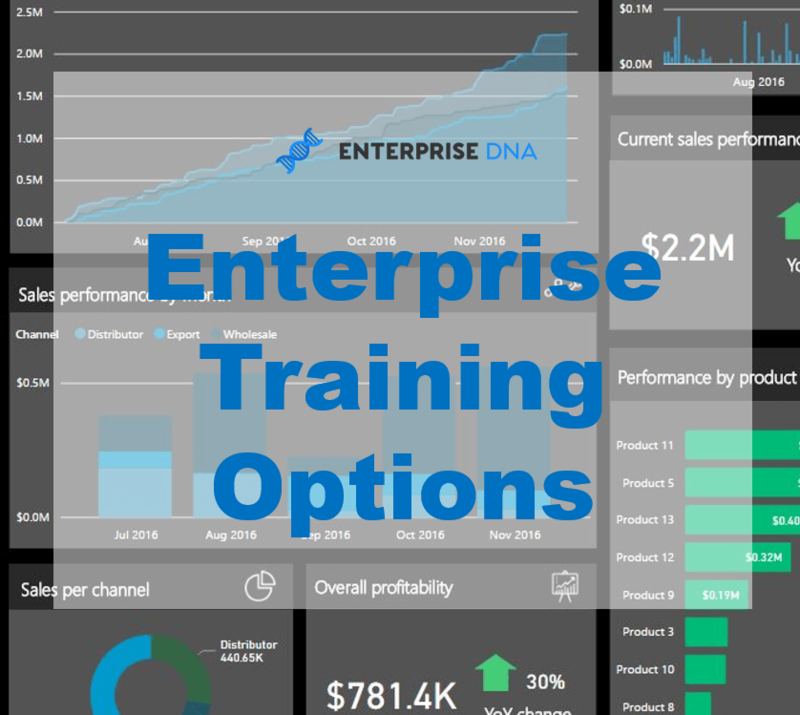 I signed up for the Enterprise DNA online full course package a little over a week ago and am really enjoying it, it’s well done and comes from a financial analyst perspective, which I appreciate. I’m perhaps 20% of the way through it so much more to go. I’ll most likely enroll another colleague or two as this is good stuff, keep up the strong work. That’s great Simon. I’ve sorted the forum issue now so should be able to sign up now. This is really nice stuff, well done. I signed up for the full course package about a week ago and am about 20% of the way through so lots (sorry, “heaps” as Sam would say) left still to go. I like that this comes from a real financial analyst perspective, which is helpful. Good job. Oh, and I don’t believe the log-in to the forum is actually working, FYI. Cheers.